Near the end of Ezekiel, the prophet has a vision of God’s glory returning to a restored temple (Ezek. 43:5). He has no vision of the temple being built; it is already built–without hands. 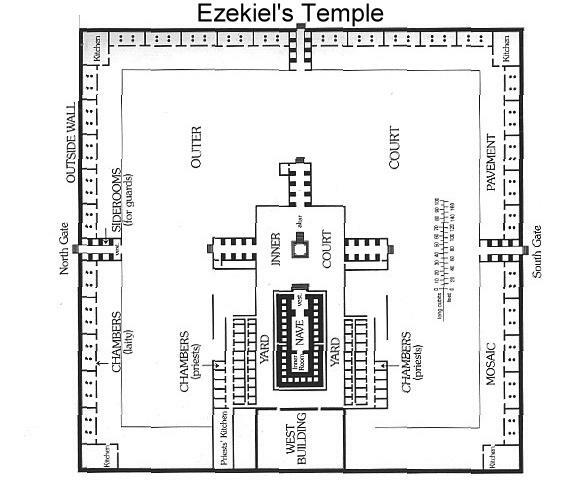 As the temple’s design is unfolded to Ezekiel, he sees that the altar lies at the center of the temple. The temple’s gates stretch out from the altar to the north, south, and east. The sanctuary extends to the west. Through this architectural design, the entire temple area is marked by an enormous cross (see picture above). Romans 6:4 says, “Christ was raised from the dead through the glory of the Father….” In fulfillment of Ezekiel’s vision, the glory of the Father returned to the temple of His Son—the temple destroyed at the cross—and brought Him out of the grave in newness of life (John 2:19-21). In this way, Jesus was restored to the fellowship of glory He had known from eternity. That said, the way Jesus would share in glory was forever changed. Like Ezekiel’s temple, the risen Christ still bore the mark of the cross. But it was more than that. In the beginning, Christ participated in glory as pure spirit, like the Father and the Holy Spirit. By becoming man, Jesus changed into a completely new being—a God-man, fully divine and fully human, a being of spirit and of body. The evangelists give us a sense of just how different this being of spirit-flesh is. The gospels record that the risen Christ could appear and vanish from sight yet eat and be felt by those who touched Him (Matt. 28:9; Luke 24:30-31; John 20:26-27, 21:12-13). That spirit and flesh were joined in Christ meant that God and humanity were joined, almost like two families are joined via marriage. Jesus will never again commune with the Godhead as pure spirit but will ever participate in glory as the temple. He was willing to give up the essence of what He was and to accept an irrevocable change in His constitution. This is an incomprehensible sacrifice. The Father and the Spirit, too, had to accept a fundamental change in the dynamic of their fellowship. But we shouldn’t imagine that this is a source of unending grief to the Trinity. It is probably more like the cliché so often uttered by parents at weddings: “We haven’t lost a son. We’ve gained a daughter.” God hasn’t lost His Son. He has gained a daughter in the church. To be sure, marriage completely changes the dynamics of a family. But hopefully, the happiness and love in a family are increased by a union and not diminished. Since it was the Trinity’s desire from the beginning to expand their fellowship, it is certainly the case that Jesus’s union with us has made their joy full (1 John 1:3, 4). Since we have been united to the temple of the Son and to the cross that marks Him, we are also united with Him in His resurrection (Rom. 6:5). We are not mere spectators of glory, as the Israelites who looked on when God’s glory descended to speak with Moses (Exodus 33:8, 9). But as part of the temple of Christ, we house and participate in glory just as Jesus does: “I have given them the glory that you gave me, that they may be one as we are one: I in them and you in me” (John 17:22, 23).